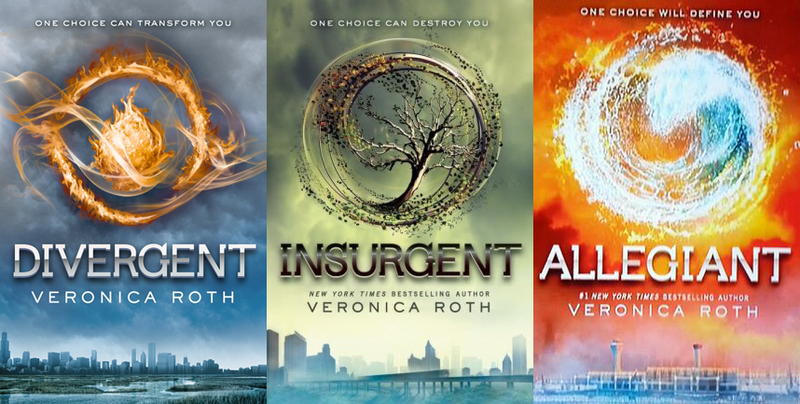 Anyone else feel let down by the ending to the Divergent series? I mean I’m all for dramatic deaths, but I have to admit that in this case… I’m not feeling it. So – When you reach page 489 – do yourself a favor and stop before the last two paragraphs, where we pick up. Most of the time I can tell when people are lying, and this must be a lie, but all I see are tears welling up in Cara’s eyes. “No,” Christina says, as we see the tears falling, smearing across Cara’s face as she bites back her emotions. We run, Christina and I. Raggedly breathing as we sprint and stumble to the hospital, the hospital that holds Uriah, not Tris. It can’t be true, and yet it is. I can see her through the window in a room not unlike the one where Uriah lays with his family surrounding him. I feel numb, yet at the same time shattered. I stand rooted to the spot until Christina yanks me forward, rushing into the room and toward the bedside. It makes sense. It makes sense that Tris would be the one to enter the Weapons Lab, not Caleb. How could I not see that in her face before I left? How did I let myself believe that we would come out of this whole? Her hand is warm, and gives me strength. I clutch it while tears stream down my face. I lean towards her ear and whisper “Come back to me, come back to me Tris, I can’t do this without you. I love you.” I stare at Christina across the hospital bed, eyes unseeing. I am wrapped in my mothers embrace. The one that I have longed for. There are so many questions that I want to ask her, I want to know about her relationship with David when they both lived at the compound. I want to know how she knew that she was in love with my father, enough to place love over faction, to leave her plans behind. It’s almost as if she never left me, she is just as real as Tobias. Tobias… A new thought shifts to the front of my consciousness, Tobias. Caleb will tell Tobias that I never wanted to leave him. He knows that I love him, he will understand… Or will he? I disentangle myself from the embrace and step back. Do you think that caring for each other will be enough? They have already lost so many, will they be able to withstand another blow right on the back of Uriah? I still haven’t said goodbye to Uriah after all. I promised Christina that she would never lose me, am I ready to take that promise back? Most of all Tobias, and those calm moments full of laughter that I am so looking forward to. I can’t leave that behind. My mother gazes at me, arm outreached ready to lead me farther down this path, but I hesitate. She must see the look on my face, the creeping sadness that bleeds into my expression when I think of leaving her behind. It is time for us to say our last goodbyes to Uriah. As we file into the room I can’t quite bring myself to look Zeke in the eye. I failed him, and Uriah paid the price. We will leave these last moments of peace to his family. It’s the least I can do. Christina lingers after we walk out, searching in vain to understand why this is happening. I walk down towards Tris. The fog around me hasn’t lifted in the days since our return, cloaking me in grief and anger with each breath I take. Caleb stays his distance, and for that I am grateful. Why would she choose to save him instead of herself, knowing all that he had done? I will never understand. David turns the corner in front of me and I feel anger rising like bile in my throat. This is all his fault. He has taken the only thing in love. Sacrificed her to his lust for power and control. Suddenly Christina is prying my fingers from his throat. I didn’t even realize that I had started choking him. I scream “This is ALL YOUR FAULT.” And walk away. She needs me. I hurt everywhere. My body aches, my mouth is bone dry and my eyes feel like sandpaper. I try to open them, but they remain firmly shut. I’m so exhausted. I’ll just sleep for a little while and try again. I’m so tired of fighting, tired of being brave. When I look at her everything feels surreal. Like at any moment she will open her eyes and come back to me. I can not believe that I will never see her sparkling eyes again. She is in there somewhere, and she is a fighter. I cannot sit here any longer holding her hand. I need to be closer. The morning everything changed I woke up next to her, and that is what I want most. That moment back. I crawl into her bed and curl up beside her small body. I wake with a jolt. Something is happening. Tris? She lays beside me but I feel her grip my hand, and see her eyes open. She came back. I did it. I opened my eyes, and Tobias is here. He looks terrible, bags under his eyes, rimmed red from tears, why do his fingers look like they have been clawed? My heart feels light and I haven’t stopped smiling in days. She is going to be alright. There is a long recovery road ahead, but we will conquer it together. We are Dauntless after all. She will leave the hospital today, and we will move back into the city soon- although everything will be different. The GPs have been re taught, now convinced that their memories were erased in a freak accident in the labs. As far as they know they were about to lobby the government for equal rights for the genetically damaged. I have a hard time believing that there aren’t more disappointments and battles down the road, but right now everything is at peace. Walking these halls- seeing the faces of those I have grown to know, feels wrong. They have all changed, their masks portraying a different and more serene story. Their eyes no longer grow dark, and they no longer speak of the genetically damaged as sub human. They believe in equality. It’s amazing what the memory serum can do, although I still feel a pit in my stomach when I think about the memories that I have taken away from them. When I walk into the dormitory I see Tobias packing the last of our things. Christina, Caleb, and Cara have already left, taking up residence among our old neighbors in our old lives, now without the faction system. We are adjusting to life after war. The apartment that we picked out is filled with light as we step in. The floor to ceiling windows looking down on the hub, and the furniture I have collected for us makes it feel like home. This is our new start. Our new beginning. We will be building our lives today and every day after. Although the choice was difficult we decided to come home. This city holds so many memories, good and bad. Marcus. Evelyn. Tris’ parents. Will. The first time I saw her. Our first kiss. The start of this journey that we are on. We belong to this place, and it to us. Now that the factions are gone there will be a new government in place. One that we intend to be a part of. We want to aid in continuing the positive momentum we have grown. I know Tris will make a great leader, and I hope I will too. We are home. The word feels weird in my mouth, could this really be a new and clean place to create memories? A place to fill with love, laughter, and the occasional slow moment. So much of our relationship has been fighting and running, now we finally have a chance to be happy, and I can’t wait. Tobias is unpacking as I watch. He is so beautiful, the flames on his chest glint in the sunshine as he carries our belongings to their new places. “Get a move on, Four.” I shout with a smile as he turns to me. He puts his hand flat to my stomach, just like the first time. It lights a fire within me as I draw his face toward mine, his fingers pulling at the hem on my shirt. We meld together. Skin on skin, his hands hesitate at my waist, but I step out of my clothes willingly. And for the first time I am not afraid.